At Dean's Cards, we buy hundreds of vintage baseball card collections every year. These collections range from cards acquired during childhood (that have most likely been sitting in a closet or attic for years), to collectors selling their baseball card sets and cards that have taken years to acquire through shows, card shops, or a website like DeansCards.com. Everyone has their own reasons for selling their vintage cards, and one of the most common reasons for selling cards is due to down-sizing. Over the past few months, we have bought over 5000 cards from a gentlemen who is doing just that. And as you will come to find, this particular collector had an affinity for all things 1956 Topps! He started off by mailing in 13 Davy Crockett Orange Sets (with duplicates), and it is the most Davy Crockett cards we’ve ever seen in one place! This set really is an interesting release by Topps. While today we mainly see action figures of our favorite movie characters and super heroes, back in the 1950's, trading cards were the equivalent. 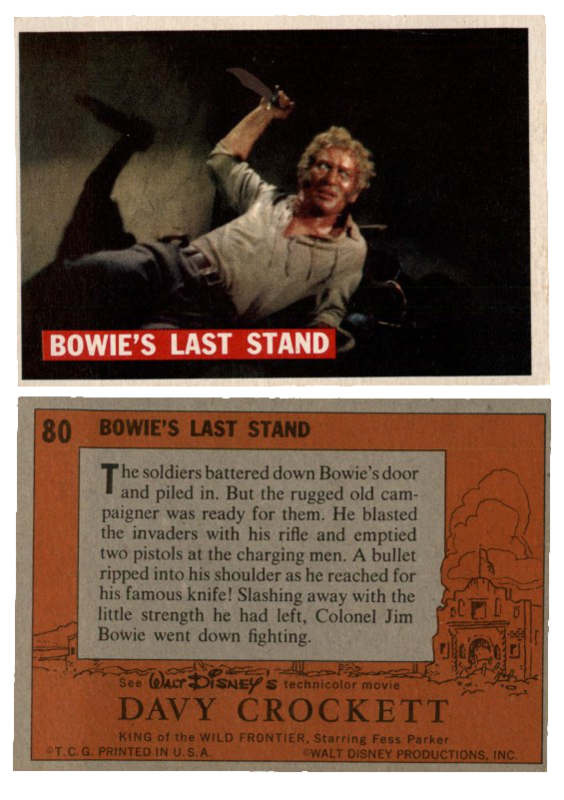 Thus when the Walt Disney film "Davy Crockett King of the Wild Frontier" premiered in 1955, naturally the movie appeared in playing card form as well. 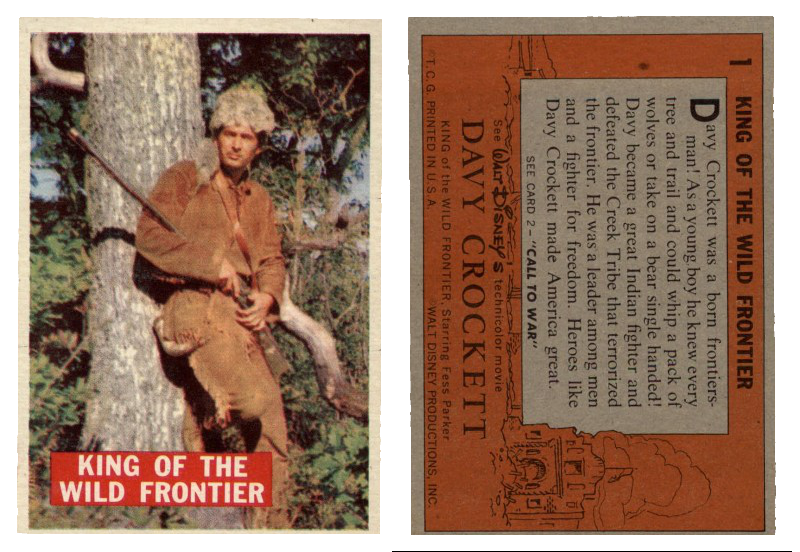 The 1956 Topps Davy Crockett trading card set originally consisted of 80 cards that could be purchased in 1-cent and 5-cent wax packs each with a stick of bubble gum. The cards were numbered and when all 80 orange-backed cards were put in sequence, the entire movie was in the palm of one's hand. If you're interested in buying a 1956 Davy Crockett Orange Back Complete Set (or two!) we know just the place. 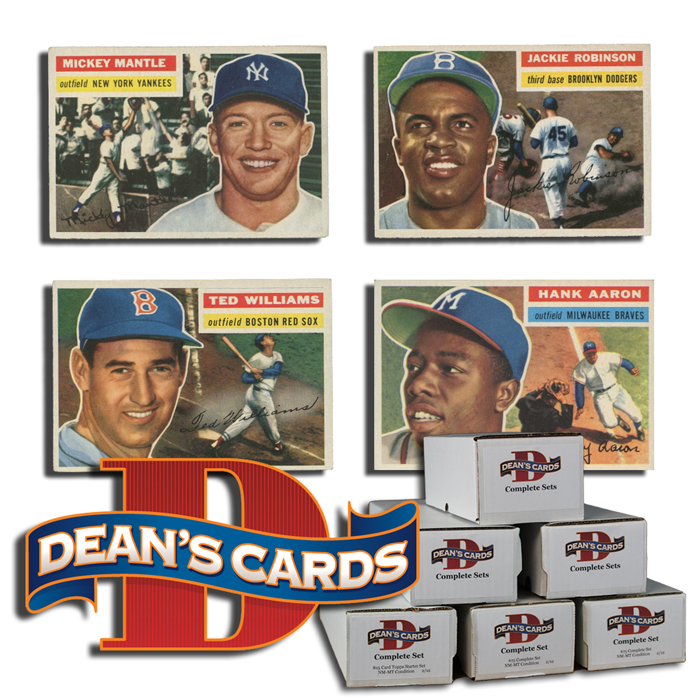 Dean's Cards has over 2,000 singles in stock as well, with images of all cards. Relive the movie and all of Davy's exploits via this vibrant 80-card issue. For more information visit our 1956 Topps Davy Crockett Orange Back Cards Category page. After we purchased the Davy Crockett cards, we moved onto his vintage baseball card collection. He mailed in 3 pretty nice 1956 Topps complete sets, which we paid a pretty penny for (But it was worth it!). We have a number of different 1956 Topps Sets for sale. It's always great when we get we can buy multiple mid and high grade sets such as these three. All the cards get the same treatment: they are graded, scanned, sleeved (with QR code for online viewing of the scans), and placed into a set by our in-house software. The result of this is nothing short of the most consistent set for the best value of any on the market. What we didn’t know when we bought the three 1956 Topps Baseball sets, was just how many 1956 Topps cards the gentlemen had left to sell! 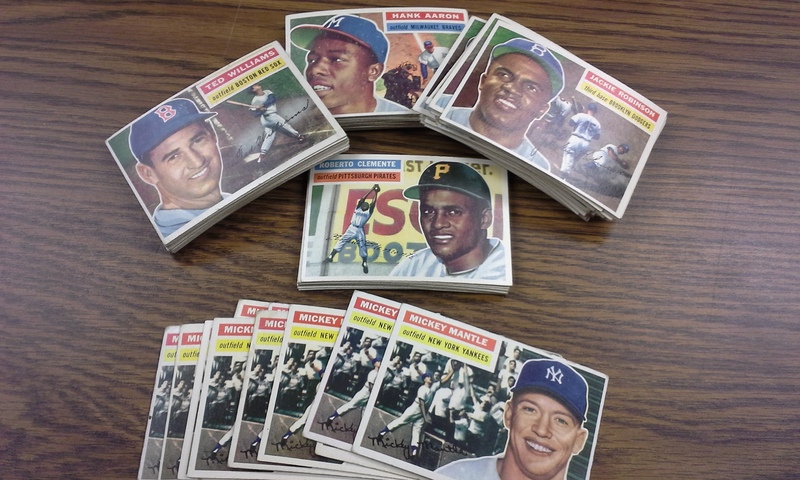 This past week, we received a shipment of nearly 4,000 1956 Topps Baseball Singles. It was unreal, we had never seen a collection of 1956 Topps like this. At the time we had over 6,000 cards in our inventory for this set, and now we were going to be able to add four thousand more! Not only was the sheer number of cards amazing, but there were also an equal number of stars and hall-of-famers included. We're talking: 29 #30 Jackie Robinson cards, 24 #31 Hank Aaron cards, 18 #5 Ted Williams cards, 18 #130 Willie Mays cards, 12 #33 Roberto Clemente cards, 14 #135 Mickey Mantle cards, and dozens upon dozens of team cards. This is the largest collection of 1956 Topps cards that we’ve purchased in the last 13 years, and it could not have gone more smoothly (for the seller as well as us). The gentlemen simply mailed in the cards in batches, and we would have an offer for him within 2 business days of receiving them. After agreeing on a price, we ordered him a bank check, and he mailed in another batch. We repeated this process several times and purchased his entire collection. If you're interested in selling your collection to us, please read our seller testimonials. On there you will find dozens upon dozens of satisfied clients. For more information on selling a vintage baseball collection in general, please click here. We look forward to hearing from you!